Tracking the movements of marlin in the Great Marlin Race yields interesting results..
A striped marlin swims away with a tag deployed by Team Black Fin on behalf of the Dana Angling Club, during the 2015 Master Angler Billfish Tournament in Balboa, California. 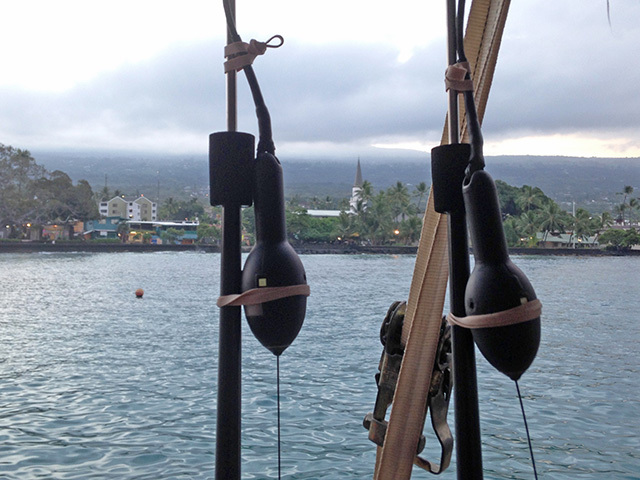 Tags await deployment at the 56th Hawaiian International Billfish Tournament. 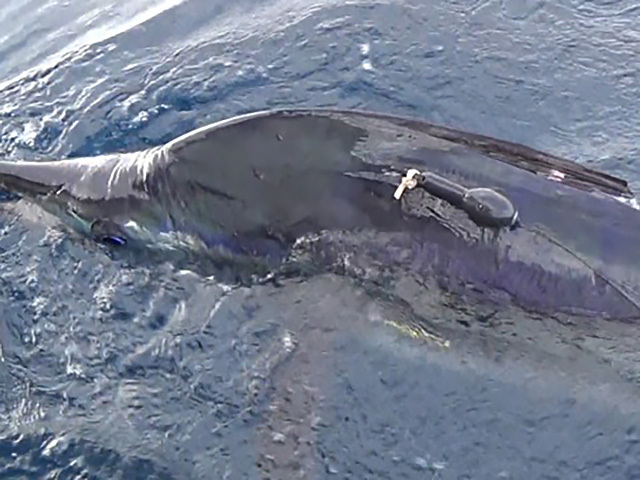 A total of 10 tags were deployed on healthy blue marlin during the event. Gladiator captain Don McIntosh is about to tag another healthy blue marlin. Mama Who owner Lainey Jones sponsored three satellite tags during the 2015 tournament season in Hamilton, Bermuda. IGFA Representative Luca Bonfanti caught and tagged an estimated 15 kg (33-pound) Mediterranean spearfish off Sardinia Island, Italy, this year. This may be the first time satellite tags have been deployed in this species and the tag should provide valuable data to scientists. The 2015-2016 IGFA Great Marlin Race season is well underway. Satellite tags have been deployed in the Bahamas, Bermuda, Japan, Italy, Hawaii and California with upcoming tagging events scheduled in Australia and the Seychelles. Since the program began in 2011, a total of 199 tags have been placed on billfish (115 blue marlin, 56 black marlin, eight striped marlin, seven sailfish, seven spearfish, and six white marlin) during 33 events in 19 countries around the globe! Collectively, these fish have swam a total linear distance of 111,237 nautical miles and counting! This marks the first time satellite tags are programmed for 240 days instead of the 180-day duration, which has been used in past IGMR race years. This change was made possible by the higher success rates experienced in the program by fully transitioning to Wildlife Computer’s smaller and lighter miniPAT sat tags. We hope the additional 60 days of data will enable us to learn even more about the migrations of these amazing fish. The first IGMR event of the race year took place during the 2015 Custom Shootout on May 13-16, out of Abaco Beach Resort and Marina in the Bahamas. During the catch-and-release event, 52 custom-built sport-fishing yachts entered the 14th annual fund-raising tournament where a total of eight miniPAT tags were sponsored for the tournament by Jim Jensen of Plane Simple, Todd Reaves of Soul Candy, Keith Beaty of Sweet Thing, John Lee of Committed, IGFA Trustee Roy Cronacher Jr. of Gladiator, Bill Haugland of Lights Out, Harry Rusbridge of Sonny Boy, and Jay Hayden of MV Rose. Five of the eight tags were deployed during the following weeks after the tournament. Unfortunately, two of the tags reported within a few days after deployment, but the remaining three tags are still at large and are programmed to surface next January. 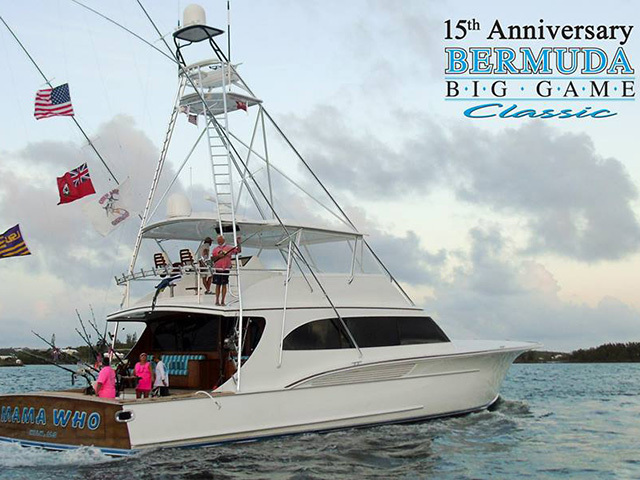 Ten more tags were generously sponsored for the inaugural 2015 Hamilton, Bermuda IGFA Great Marlin Race during the 2015 Bermuda Billfish Release Cup and the 2015 Bermuda Triple Crown Billfish Championship, which includes the Bermuda Billfish Blast, Bermuda Big Game Classic and Sea Horse Anglers Club Billfish Tournament, all of which are held in July. During the Bermuda Billfish Release Cup and Billfish Blast, two blue marlin were released with satellite tags caught and sponsored by Lainey Jones of Mama Who, and a tag sponsored by Galati Yacht Sales was placed on a blue the following week during the Bermuda Big Game Classic. In the last leg of the tournament (Sea Horse Anglers Club Billfish Tournament), six more healthy blue marlin swam away with satellite tags sponsored by Dan Murphy of Last Stall, Frank and Mary Ellen Rodriguez of Fa-La-Me, Wally Whitley of Que Mas, Lainey Jones of Mama Who, Moises Roman Maionica of Marlin Raptor, and Raymond Craig of Amarula Sun. One more tag generously sponsored by Jim Jensen of Plane Simple is awaiting deployment. On July 15, 2015, IGFA Representative Luca Bonfanti was fishing off the coast of Porto Cervo in Sardinia Island, Italy when he caught and tagged an estimated 15 kg (33 -pound) Mediterranean spearfish (Tetrapturus belone) from his boat Maguro-San. 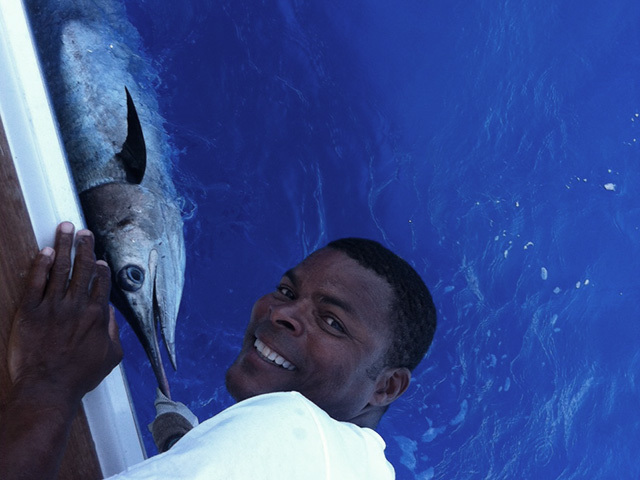 Just four months prior, IGFA Chairman Packy Offield and son Chase Offield placed six tags on shortbill spearfish (Tetrapturus angustirostris) while fishing together in Hawaii. 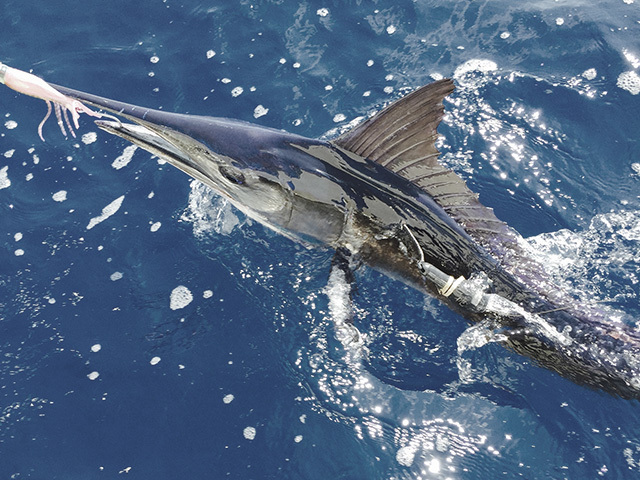 Not only did these events mark the first time spearfish were added to the IGFA Great Marlin Race, but to our knowledge, this is the first time satellite tags have ever been deployed in both species! This data will be of particular interest to scientists, as very little is known about the migratory behavior of spearfish. July marked the debut of the IGMR in Japan! During the Japan International Billfish Tournament, five miniPAT tags were sponsored by IGFA Chairman Packy Offield and the Japan Game Fish Association. Although typhoon Nangka severely affected the first few days of fishing, 19 blue marlin were caught during the final day of the tournament and four were released with satellite tags! The IGMR returned to its roots during the 56th Hawaiian International Billfish Tournament (HIBT) which took place on August 10-14, in Kailua-Kona, Hawaii where 10 tags were deployed on healthy blue marlin by teams Kona Game Fishing Club Osaka, Game Fishing Club of South Australia #2, Kona Game Fishing Club Taiyo, Game Fishing Club of South Australia #1, Laguna Niguel Billfish Club Teams 1 & 2, Team Greenberg Family/Joshua Tree Foundation, and Laguna Niguel Billfish Club Team 3. The IGMR joined the 34th Annual Master Angler Billfish Tournament (MABT) in Balboa, California, on September 11-12, 2015 where anglers deployed satellite tags on striped marlin for the second year in a row. So far, two tags have been deployed by Team Black Fin on behalf of Dana Angling Club and Team Magellan on behalf of Tuna Club of Avalon. Seven more tags await deployment by Team Pescador on behalf of Tuna Club of Avalon, Team High Cotton on behalf of Balboa Angling Club, Team Andreya on behalf of Los Pescadores, Team Kea Kai on behalf of Los Pescadores, Team Royal Slam on behalf of Balboa Angling Club, Team Bounder on behalf of Los Pescadores, and Team Kea Kai & Team Royal Slam on Behalf of Los Pescadores and Balboa Angling Club. Upcoming IGMR events include the 2015 Black Marlin Classic, October 17-24, where 10 tags have already been sponsored by Peter Teakle. The SSFC Big Game Classic in Victoria, Seychelles will take place on November 21, and eight tags have already been sponsored by Bisbee’s Fish and Wildlife Conservation Fund, A1 Sportfishing, World Wildlife Fund for Nature (WWF), Oceana Fisheries, Eden Island and Seychelles Fishing Authority. We are very excited about the growth of the IGFA Great Marlin Race, which could not have been possible without the generosity of our tag sponsors and of all the tournament directors, anglers, captains and crews involved in these tournaments. Additionally, much of the success of this program can be attributed to the vision and passion of IGFA Chairman Packy Offield, who passed away on June 14, after fighting a courageous battle with cancer. It is our hope that the ongoing work of this conservation program will serve his memory well.